A couple of weeks ago, I got ThinkGeek.com’s “Bag of Holding” messenger bag as an early Yuletide gift from my awesome wife. I immediately decided to put the messenger bag to the challenge of its namesake by stuffing as much gaming paraphernalia into as I could. 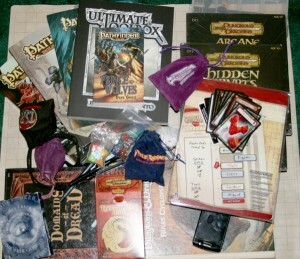 After the dust settled, the Bag of Holding was able to carry 22 pounds of gaming goodness! The bag itself is constructed from a heavy and durable grey canvas, very much like denim in texture. Unlike it is advertised, the “fourth Velcro compartment” does not use Velcro, it instead uses two lightly magnetic snaps like the outside flap does. There is definitely a lot of storage space and the main padded laptop compartment feels like it might actually protect something. In the main compartment I opted out of a laptop and instead packed the Pathfinder RPG Core Rulebook, Pathfinder Bestiary, Pathfinder Bonus Bestiary, and the ever useful Ultimate Toolbox. That’s 1346 pages (cover to cover) of gaming! You could easily keep two large books and a laptop in here. The second compartment is the same size as the main compartment above, but boasts an extra pouch to help keep things organized. 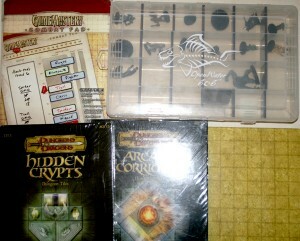 I packed a GameMastery Combat Pad (in the pouch), a tackle box (that can hold 22 medium sized minis), two dungeon tiles, and a flip-mat. 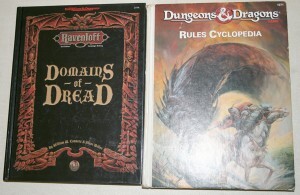 In the slightly smaller middle compartment, I packed the venerable D&D Rules Cyclopedia and the Domains of Dread Ravenloft hardcover. This amounts to another 608 pages of gaming information. 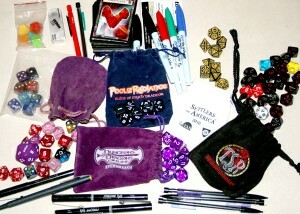 The front pouch is where I stored all my pens, pencils, dice, and item cards. I fit 5 dice bags (80+ dice), 5 pencils, an eraser, four ink pens, 5 wet erase markers, and two item card sets comfortably inside. 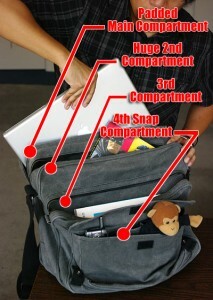 This compartment garners one, of my two, complaints about this messenger bag. Except for two pencils, I had to store all the pens and pencils loose as the pouches were too short and that left only 2 elastic slots. I might actually mod the bag with some additional pencil holders. 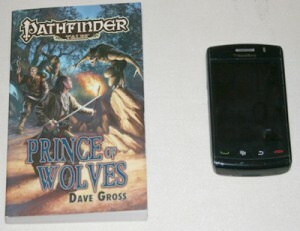 In the front zipper pouch, I put a Pathfinder Tales novel, Prince of Wolves, and my smartphone. Yeah, it might be considering cheating since the novel sticks out of the zipper, but you have to let your nerd flag fly. 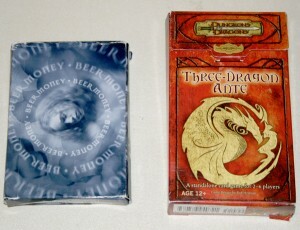 In the rear pocket, I put two card games, Three Dragon Ante and Beer Money. I could have easily fit another card deck or a paperback in there, but I was beginning to fear the shoulder strap wouldn’t hold. While not detailed as a compartment, I was also able to tuck a 25” x 25” battlemat under the flap before I snapped it shut. It did require some re-organization of the front zipper pocket and the fourth snap compartment in order for the flap snaps to remain fastened. Which brings forth my second minor complaint, the snaps could be more heavy duty (circled in red above). My concerns about the strap (or at least its mounts) weren’t warranted at all. The bag hung on my office door all night without any visible wear or stress. I can’t say the same for some of the weaker geek shoulders out there. I carried the bag to and from my car several times and while the weight was manageable for me, I doubt I’d want to carry this loadout with me all through a convention. 4.8 out of 5 Flasks! If there had been a better pen & pencil organizer and stronger fasteners, I would have given it a full 5 flask rating, so I guess I’ll just have to slap it with a 4.8. Overall, I feel like this messenger bag would be a great way for gamers to tote around their stuff. 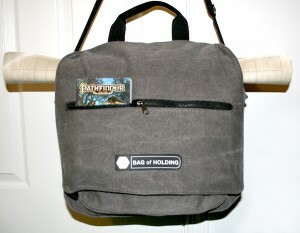 Besides, I saw plenty of 3.0 & 3.5 era messenger bags at GenCon that could use replacements. Get yours at ThinkGeek now! 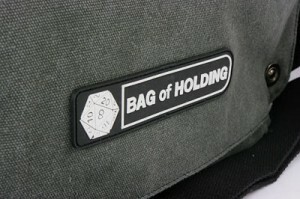 When Jeff Uurtamo of RPG Circus fame told me about this bag early this year, I knew I had to get one for Gen Con. I have used it since August almost every day now (I use it to carry my stuff to work) and I am more than pleased. Not only is it pretty sturdy and good looking, the bag is also enormously big. You don’t want to know how many books I lugged around with it at Gen Con. 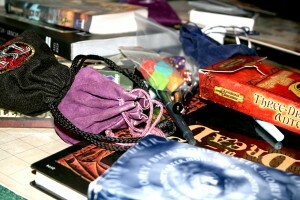 In my opinion the “Bag of Holding” is a great bag for daily use (and/or to carry your roleplaying stuff around). What really surprised me is the great quality you get for just 50 bucks. I can wholeheartedly recommend this bag. I have to say that your a bit behind the power curve. I picked mine up for GenCon (Where there were a few) and Michael from Stargazer’s World had his shipped to Zach’s ( RPGBlog2) place for GenCon in order to avoid all the odd taxes and shipping issues. GenCon Side Note, If your a Wil Wheaton fan, he too was sporting one of these at GenCon. @Stargazer: Yeah, this bag can fit a ton of stuff! It’s currently holding my laptop, a lightbox, and my drawing kit. @Tyler: It looks like they used woven nylon straps and actually sewed it into the side of the canvas. You can see a pretty good picture of the stitching in the “Battlemat & Flap Snaps” picture. @Madbrew – I only suggested Liquid Stitch because there are some places that I don’t think you can sew too. As far as pictures, that’s very true. I don’t do a lot of pictures as I seem to be a horrible photographer. Not sure why that is. At any rate, glad you are enjoying the bag. I still use my Backpack for work, but I have the Bag of Holding as my RPG “Jump” Bag. Just pick it up and I’m ready to go gaming somewhere. @Tyler – Yes the Straps are sturdy as well as the rings that the straps are attached too. They didn’t use low grade weak metal there. For 50 USD, I can’t think of a better bag. Glad to hear the shoulder strap is sturdy. That seems to be a chronic weak point in many messenger bags on the market — particularly when someone gets the bright idea of attaching them to the covering flap, rather than the body of the bag. This may be the start of a new “show us your (dice) sack” meme, only with the containers we use to haul our gaming stuff around. A friend of mine has been using one of these for some months. He indicated that the weak point of his bag has been the zippers, with two needing replacement. Other than that, the bag has served him well. @Sir Wulf: Were they just the pull tabs separating from the slider or the entire slider coming off the chain? I’ll definitely have to keep an eye on them, thanks for the info! I’ve seen this thing floating around the web for some time, but this is the first real review. I’d be interested in seeing a 6 month, 600 mile follow-up too! @Craig: I’m definitely going to follow up once I’ve put it through the ringer. So far it’s performing pretty well. I’ve even used it as my range bag to carry all my extra magazine, ammunition (which can be heavy), tools, and cleaning supplies and it’s working great so far. @Seth: Ugh. That’s definitely a deal breaker. I actually got one of these about a week ago. I love the bag itself, but I’m having zipper problems too – this morning, in class, the zipper on the laptop compartment gave way completely. I’d closed it, and looked down to find it open, with the slider still stuck at the far end. Now it won’t close at all, and I’ve just submitted an RMA on the thing, which is a damn shame and is going to leave me with a decidedly inferior bag for a week or two. 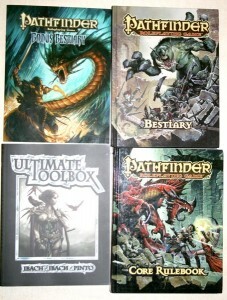 Pingback: Stargazer's World » Ask the readers: Tools of the trade, RPG book transportation!